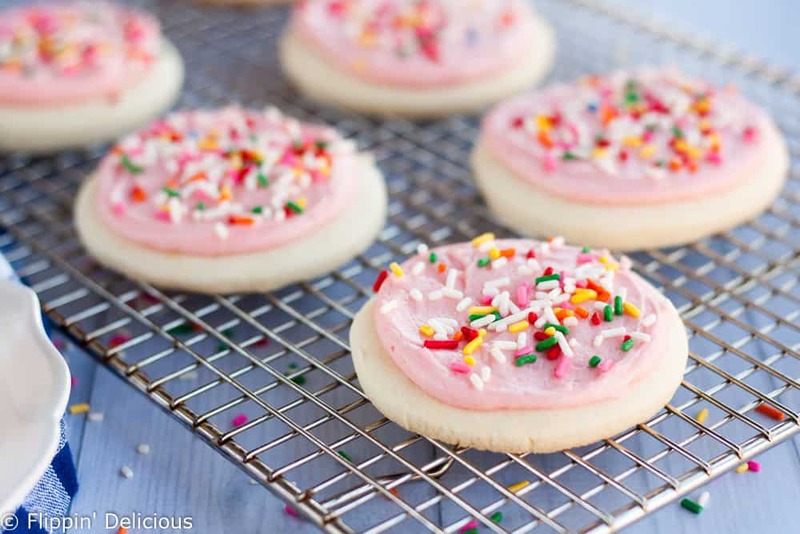 Gluten free sugar cookies with frosting and sprinkles are a classic! My gluten free sugar cookie recipe is easy to make, and the dough doesn’t need to chill! These gluten free frosted sugar cookies are soft and cakey, just like a Lofthouse Cookie. These are the perfect gluten free soft frosted sugar cookies cutout recipe! 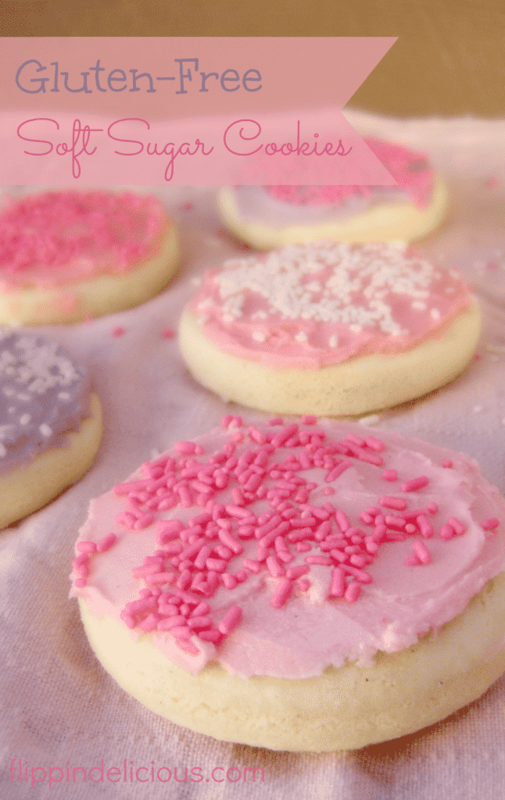 These gluten free sugar cookies are a dead ringer for Lofthouse soft frosted sugar cookies! You are going to love this gluten free Lofthouse Copy Cat recipe. 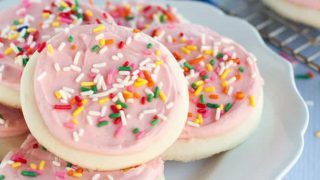 For years I have tryed to re-create those soft, cakey, sugar cookies with frosting and sprinkles that come in a clear plastic clamshell at the grocery store. I tried to create those soft frosted sugar cookies using normal wheat flour and still wasn’t able to get it right. A few years back I finally created the perfect gluten free soft frosted sugar cookie recipe, and I’m so excited t0 share it with you! I’ve baked these gluten free soft frosted sugar cookies hundreds of times, it is one of my most popular recipes and I’m always asked to bake them. I’m known for my gluten free soft frosted sugar cookies, and am semi-famous for showing up with a bag full of mini soft frosted sugar cookies at blogging conferences. I used to have an older version of this recipe on my blog (if you printed it, you might have that gluten free sugar cookie recipe), and another version in my cookbook, The Essential Gluten-Free Cookie Guide. I’m always making adjustments and improvements so this version of the recipe is the best yet! I’ve been very excited to share my new and improved recipe with you! The dough is easier to work with, there is no chill time, and I’ve mastered the techniques for making these gluten free sugar cookies much easier to frost and cut out. If you are looking for more gluten free cookie recipes, check out my newest cookbook, Gluten-Free Holiday Cookies. How to make gluten free sugar cookies? Here are my best-kept secrets for making the perfect gluten free soft sugar cookies with frosting. Be very careful in measuring your flour. Don’t scoop using the measuring cup, or pack it in! To correctly measure your gluten free flour carefully spoon the flour into the measuring cup and then level it with a knife. The most accurate way to measure flour is by weight, and that used to be what I recommended. Over the years I’ve discovered that I get the same results if I accurately measure my gluten free flour, without keeping a scale in my kitchen. I know most of you don’t have a scale, and I wanted you to be able to make these gluten free sugar cookies without buying another kitchen gadget. I have provided ingredient weights, if you prefer to measure with a scale. For best results use my gluten-free cookie/cake flour blend. Another gluten-free flour may work as well, but I haven’t tested any other gluten free flours yet. If you try a different flour, please comment and let me know. I have heard from those who have tried to use regular wheat flour that is doesn’t work. This recipe is easiest to make with a stand or heavy-duty electric hand mixer. You can make the dough by hand, but it will require a lot of elbow grease. The secret to soft and cakey gluten free soft frosted sugar cookies is roll it out pretty thick. Try to avoid handling it too much, and do NOT over bake. It is much better to under bake your gluten free soft frosted sugar cookies. It will not look done when you take it out of the oven, but that is what carryover cooking is for. You can make these gluten free sugar cookies dairy free or vegan! 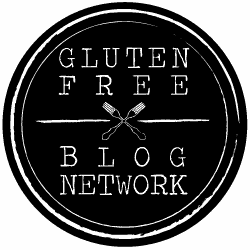 Keep reading, I share my tips for making gluten free vegan sugar cookies in great detail later in this post. How to make gluten free drop sugar cookies? Drop the dough onto prepared baking sheet using a 1 1/2 tablespoon cookie scoop. Dip the bottom of a drinking glass in white sugar and gently press the gluten free sugar cookie out so it is about 3 inches across. The extra sugar adds a pleasant crunch! If you were to use colored sugar no added decorations would be needed. If you want the ultimate lazy gluten free chewy sugar cookie, they are even easier. How to make perfect gluten free sugar cookie cut outs? I’ve found the best way to make perfect gluten free sugar cookie cut outs is to roll the gluten free sugar cookie dough out directly on top of the silicone baking mat or parchment paper you will bake them on. I created a video tutorial in my gluten free cutout sugar cookies for Christmas post. Lay your silicone baking mat or a sheet of parchment paper on the counter top. Place the dough on top, and then place a sheet of plastic wrap on top. Roll the gluten free sugar cookie dough out approx ½ inch thick. Peel off plastic wrap and cut the gluten free sugar cookies out using your favorite shaped cookie cutters, leaving at least 2 inches between the gluten free sugar cookies. DO NOT take the sugar cookies off of the baking mat or bottom piece of parchment. Not taking them off prevents the dough from stretching out of shape. Peel the excess dough off and re-roll the same way, onto a new baking mat or sheet of parchment. 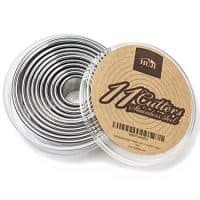 If you are only cutting out rounds, you roll can roll the dough out between 2 sheets of plastic wrap (½ inch thick) and then move the cut outs to the silicone baking mat or parchment lined baking sheet. They may stretch slightly, but I’ve found that the extra effort isn’t worth it when making plain round gluten free sugar cookies. How to make mini gluten free sugar cookies? I love to make mini gluten free sugar cookies using a 1 ½ – 2 inch round cutter. I’ll also use mini holiday cookie cutters like hearts and stars, but I’ve found that any protruding edges (like the points on the stars) tend to over-bake a bit and become more crunchy. Still delicious, just not as soft all the way through. If you cut out shapes just be more careful to not let the gluten free sugar cookies over-bake. They soften more as you let them sit, frosted, in an air-tight container and then the crunchy star points soften. How to frost gluten free sugar cookies? The easiest way to frost your gluten free sugar cookies is by using a piping bag. I’ve found it is less messy than just using a butter knife. I still use a knife, but I wanted to share my tips for using a piping bag or ziploc bag because it will change the way you decorate your gluten free sugar cookies for the rest of your life! Hold the piping tip perpendicular to the gluten free sugar cookie and pipe a layer of frosting, starting at the edge and going around in a circular pattern without overlapping until you are in the center. If desired smooth out the frosting with a small offset spatula and top with some sprinkles. 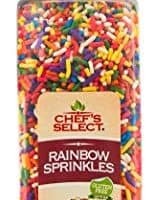 Because SPRINKLES! You can also frost your sugar cookies with an egg-free royal icing and follow any sugar cookie decorating tutorial you find on Facebook or Youtube. A tip I was reminded of by CottonStem (when she made my gluten free sugar cookies during the Christmas holidays) is to melt store-bought canned frosting that works with your allergens. You can quickly pour the frosting over your cookies, or dip them into the melted frosting before adding sprinkles. How to store gluten free sugar cookies? These gluten free sugar cookies are even softer the next day! After frosting them, seal in an airtight container or ziploc bag. The extra moisture from the frosting softens any crunchy edges and you have the perfect gluten free soft frosted sugar cookies. I still love eating my gluten free soft sugar cookies freshly frosted, but I think they are even better on day 2 or 3. Store them in an airtight container at room temperature for 2-3 days, or in the fridge for up to a week. How to make Gluten Free Vegan Sugar Cookies? Use a non-dairy butter substitute instead of the butter. My secret is to use half palm shortening, and half Earth Balance, or another vegan butter. I have also used butter flavored shortening (like crisco) but my secret combo of palm shortening/Earth Balance makes dairy free sugar cookies with the best texture and flavor. Use a “flax egg” for every egg in the recipe. You can also use another egg substitute, if you prefer. To make 1 flax egg mix 1 tablespoon ground flax seed with 3 tablespoons hot water and let it sit for at least 5 minutes before using. The recipe calls for 2 eggs so I mixed 2 tablespoons of ground flax seed with 6 tablespoons of hot water. Use my vegan buttercream frosting instead of my american buttercream frosting. The rest of the instructions and ingredients are the same. However, I do have a gluten free vegan sugar cookie recipe with the substitutions already calculated for you. With these 3 substitutions your gluten free soft frosted sugar cookies are now vegan and free of the top 8 allergens. Gluten free sugar cookies are perfect for so many holidays! Here are some of my favorite ways to decorate sugar cookies for the holidays. Here is my famous gluten free soft sugar cookie recipe! 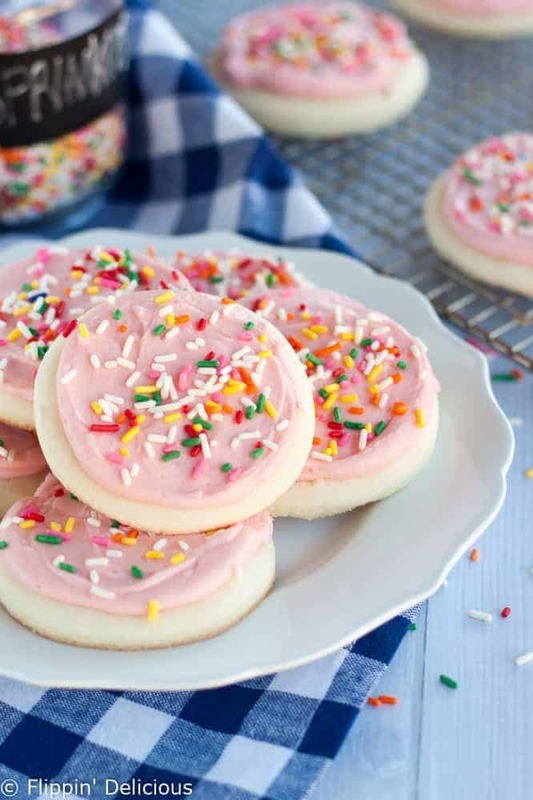 Gluten free sugar cookies with frosting and sprinkles are a classic! My gluten free sugar cookie recipe is easy to make, and the dough doesn't need to chill! These gluten free frosted sugar cookies are soft and cakey, just like a Lofthouse Cookie. Cream the butter and sugar together on low-medium speed. Add the eggs and beat until smooth. Bake in your pre-heated oven for 8-10 minutes. They will still be soft but the edges will just start to look dry, and the bottom of the cookie will just be starting to brown. They won’t look done. If they look done, they are over-baked and may be burnt on the bottom. Let cool for 5-10 minutes on the baking sheet, and then remove to a cooling rack. They look and TASTE just like them, I swear. Let me know how they turn out when you make them. I love feedback! My daughter is gluten and dairy free and she so wants sugar cookies to decorate. Can you tell me about the rice flour blend. I know it says 3 cups but how much of each of the blend do I use? Thank you so much. I am new at all of this. I responded to your email. For everyone’s reference my flour blend is found here. Your cookies were delicious! Thanks so much for sharing 🙂 It was so nice to meet you at BYB! Thanks! It was great to meet you too. BYB2013 was awesome! Just had many teeth removed and need a sweet soft treat, thank you for this recipe I can’t wait to make them tomorrow. OK – these cookies taste absolutely AMAZING! After letting the dough relax a bit out of the fridge and reworking it with my hands, it rolled extremely well. I didn’t even need the plastic wrap. I got 26 cookies out of the batch of dough with a mix of large butterfly, cat, and bunny shapes and slightly smaller circle, heart, and flower shapes. I was skeptical in the middle of the process, but so happy with the results. Thank you!! I’m so glad you saw it through and it worked out! Especially if you use all butter the dough will be very, VERY firm when it first comes out, I will go back and note that in the recipe. How many cookies you get entirely depends on the size of the cookie cutters you use. I normally use rounds (or occasionally hearts). The number of cookies I get each time varies depending on which shape I use. Thank you so much for your feedback! It really helps me so that I can make my content most useful to you. I’m very happy that you enjoyed them. Thanks for visiting my blog! I can’t wait to make these! 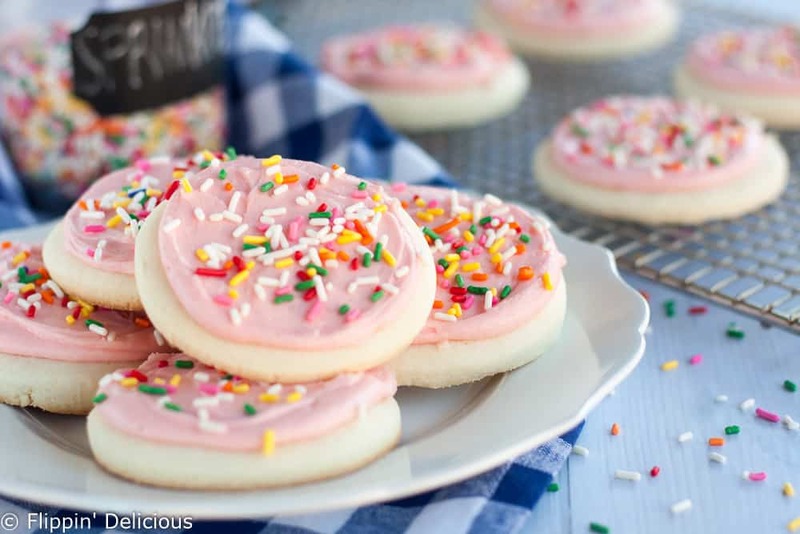 Sugar cookies is a favorite in our house, and these look amazing! Thanks Dina! I hope your family enjoys them! Best recipe, hands down. 🙂 I would cry if I ever were to lose this recipe again! I so glad you love them! I’m also super excited for my cookbook. I’m working with a publisher now, so it will also be available in print! These cookies remind me of the “pink cookies” aka sugar cookies with pink frosting that I grew up loving. Thank you so much for sharing. They are going to be a hit for Valentine’s in our house. I’m so glad that you are enjoying them. I love making them for Valentine’s day! I don’t usually write to people that I don’t know, but something drew me to these cookies, and they are fantastic. The perfect way to celebrate this weekend that is a combination of Valentine’s Day, wedding anniversary and birthday. The dough is easy to make and easy to work with… no mess, no fuss. Perfect results! I’ll be coming back to this recipe as well as to this blog… thanks so much, Brianna! I’m so very happy that you enjoyed them! Happy Anniversary, and Birthday! I know that this is one of my favorite recipes to celebrate with. Thanks so much for commenting and for reading my little blog! Made these cookies twice so far, and they are great! Making them again for a birthday party this weekend. They don’t taste GF at all! This rice flour blend who makes it? It is my own flour blend that I’ve developed that I use in all of my recipes. You can click the link in the recipe, or just go here: https://flippindelicious.com/gf-supplies-and-flours for the proportions. New GF family here. Just made my first dessert tonight. Just found these and this is in my top 5 favorite cookies. Question though, instead of buying the rice flour and the extras that go with it could I just use the GF Bisquick? I have not tested it with GF Bisquick (and have actually never used it.) If I remember correctly the GF Bisquick is made of a rice flour base. I would assume you can use it, you’d just probably have to omit the baking powder if the Bisquick already has it, and maybe the salt too. If you try it let me know how it turns out. 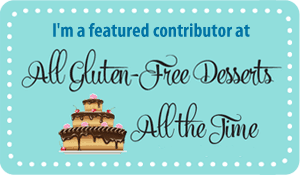 Good luck, and welcome to Flippin’ Delicious and gluten-free baking! We made these today for Easter fun and they turned out dry. I followed the recipe exactly, did I do something wrong? They did hold their shape and looked good. The only thing is we are semi high elevation here in Utah. Would that make a difference? I have had mostly successes in this elevation. The kids didn’t seem to mind, they really liked them! I am actually at high elevation (I think about 5k) so that probably wouldn’t be it. It is probably how you measured the flour, it is so hard to measure flour accurately and just a little extra flour can make the dough dry and harder to work with. An updated version of this recipe is in my cookbook (coming out soon!) where I measured the flour by weight, which eliminates the issues that differences in measuring creates. You probably just scooped your flours differently than I did, so next time just use less than you did this time. I know this post is 2 yrs ago but I had the same issue with the dryness! I leveled perfectly as directed by the ounces. So I added another 4oz stick of butter and they were perfect! I cooked them closer to 10 min instead of 8. Did you use the recipe that was sent by email? The original version of the recipe that was dryer, but I have since made some changes and I haven’t had that problem. I’d love some more info. I apologize that the link was broken. I just moved my blog to wordpress and there have been just a few links like this that have been broken, so thank you for alerting me to it. My rice flour blend is HERE. I’ve also updated the link in the recipe. Happy Baking! This is the easiest cookie recipe. I don’t have much luck with sugar cookie recipes with plain ol’ wheat flour but these turned out great. Best of all my kids don’t know the difference and they loved them! Thank you! I’m hooked! I’m so happy that you and your family loved them! Your recipes look delicious! Please add me to your email list! It looks like you have signed up Lyn. Just be sure to confirm your subscription so that you receive the emails. You should have received an email from me that has a link in it. Just click the link and it should confirm your subscription. I made these with King Arthur GF flour and they were delicious! So soft and fluffy! Sadly, I tried to make them using regular flour for my family, and the cookies were hard and flat. Note: the GF dough was a little too sticky to roll out without wasting a lot of flour, so I just rolled them into little balls and flattened them out with my fingers. I’m so happy you tried them Krista. It is interesting to know that the recipe didn’t turn out when using normal flour. I actually never roll the dough out with flour. I roll the dough out between 2 sheets of plastic wrap and I also make sure it is thoroughly chilled so that it isn’t sticky. Adding the extra flour when rolling can sometimes make the cookies tough. I also use the drop cookie method, flattening the cookies with a glass dipped in sugar. There are a lot of tricks and tips in my cookbook for these cookies. They are my all time favorite! I am making these for my son’s Valentine Party at school. Can these be made a few days ahead without drying out, or should I bake them, freeze them, and then frost them the night before? I actually think they are better after a day or 2 in an airtight container. As they sit the frosting softens the cookie and then they taste exactly like the Lofthouse Sugar Cookies. I’d refrigerate the frosted cookies because of the butter in the frosting if you are going to make them more than a day ahead of time. They also freeze great frosted! Just thaw before eating. Just like fresh baked! If you try it let us know. I’m not familiar with that blend, and have not tested it. It very well might work, but I can’t tell you for sure. My flour blend is different from most other gluten-free flour blends as it has a higher starch content. Especially for my sugar cookies I recommend using it because it helps to give them their soft cakey texture. I was skeptical of making these because I’ve had such bad luck with gluten free recipes that people rave about…BUT these are delicious! They are a bit dense and heavy, but still taste like sugar cookies. Thank you for making the Valentine dreams of my recently diagnosed celiac son’s dreams come true! I will be taking these to his class today and I think he will love them. Hello! 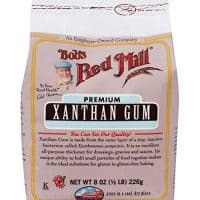 We have a Sugar and Spice premade “all purpose” gluten free flour that already has Xantham gum, so would I be able to leave out the xantham gum? Thanks! If you are trying a different flour blend that already has xanthan gum in it definitely don’t add more! I’m not sure if your flour blend will work, I haven’t had as much success when I’ve tried making them with different flours. I hope it works! Really liked the recipe and posted a slightly modified recipe on my gluten free blog! Please feel free to check it out. I’m sorry that you have allergies to both rice and gluten, that makes things so much harder! Especially since most manufactured GF products use rice. I haven’t tested it, but what I would recommend trying is a combo of millet and sorghum flour instead of the rice flour. It will taste different, since those are flours with flavors, but with a little trial and error I think you’ll be able to at least get similar textural results. I wouldn’t recommend a bean based flour with this recipe. Good luck! i have been trying to make these again but for some reason i can’t open the link that i had gotten in my email is there anyway you can send it to me again? There has been some sort of issue just with the redirect from the email this morning. It is getting fixed. I’ll email you the direct link with the email address you used to comment. I’ve been trying to subscribe to your newsletter for two days and haven’t received a link for your recipe or newsletter. Is it possible to add me on your end? Thank you. My records show that you subscribed today. You should have gotten the recipe, it sends automatically less than a minute after you subscribe. Check your spam, sometimes it gets booted there. If you still can’t find it, let me know and I will try re sending it to you. I just stumbled not this recipe and wow – my mind is blown – these look amazing! Just made these cookies last weekend after 8+ years of not having these types of cookies from the store. These were amazing! Great texture and your American Buttercream Frosting recipe really topped them off! I should admit I subbed your gluten free flour recommendations for a gluten free flour blend with xantham gum included (Namaste Foods brand), but I was still very pleased with the result. I will definitely be making these again! Thank you for the recipe!! I am so happy that you enjoyed them Andrea! I have recognized that there are a lot of good gluten free flour blends now (that I think are better than my own.) So I am happy to hear that Namaste Foods Brand GF flour worked well for you. My favorite blends right now are GF Mama and GF Jules, but I haven’t tried them in these cookies yet. On my to-do list! Hi! Often times the first email will get kicked to your spam or promotion tab. Did you check there? Also, which email did you use to register? Email me at flippindelicious(at)gmail(dot)com and I’ll help you get it sorted out. Hi, I just signed up to receive this recipe, but did not get an email in my inbox or my spam. Please send me the recipe!!! Hi Ashley! Double check your spam. Often times it gets kicked there first. Once you confirm your subscription to my email newsletter the recipe will be automatically sent to you. I’m allergic to rice:( what would you suggest as the rice flour sub?? I would substitute another flour with a similar protein content. These substitutions from GFandMore Magazine are helpful. I would substitute a flour from the neutral/light column if you can, or I would use a flour from the high protein column like sorghum or millet. I would avoid anything flours with a strong flavor because there is nothing to mask their taste. OMG they look so beautiful, absolutely gorgeous, I doubt if i’ll be able to eat them at all! May be i’ll simply keep looking at them! Well, it is certainly less calories to just look at them. 😉 It is hard to not eat them all though once you take a bite. My son chose these as the Christmas cookies this year, it’s his first full year Gluten Free and he was so excited I found these. However, for the flour blend, excuse my ignorance, I wasn’t planning on buying all those bags of flour as I don’t bake as often anymore as I’m so sad that things don’t always taste as great gluten free lol….so I was going to go to my local bulk health food store to buy what I needed to make the blend. And unfortunately I speak cups not part lol…so when you say 1 part brown rice flour and 1 part white is that like 1 cup of each and then the other tapioca flour and the other one is 1 cup as well? Or is it half a cup each of the other flours? Just a bit confused on the measurements if I wanted to make just a small batch of the flour enough to make the cookies, by just going to the health bulk store? 1 part can be any measurement, as long as all of the parts are the same. 1 part can = 1 cup, or 1 part can = 6 cups, depending on how much flour you need. I can’t wait to try these cookies! I stumbled upon this recipie while looking for some GF holiday recipes for my son. In addition to gluten, he is also allergic to white potato. Do you have any suggestions for an alternative to the potato starch in your flour blend? I am having a hard time finding any premade GF flour blend without potato starch. Thanks! Hi Kalan! I would suggest substituting the potato starch in my flour blend with cornstarch or arrowroot. You should get similar results. Happy Baking! I made these last year for a cookie swap party. I could NOT believe how similar they tasted to my favorite store bought iced cookies! Amazing job with these. Thank you Alexa! I am so happy that you enjoyed these cookies so much. They are one of my favorites! I am new to the gluten free thing and I am craving cookies!! I have Namaste flour and I didn’t want to waste all that flour if it won’t work. Could you let me know! Please and Thank you! I have not used Namaste flour, so I don’t know how it would work in this recipe. Cheers! The recipe did not come through to my email after signing up twice. Hi Michelle, the recipe should send automatically after you confirm your email by clicking the green “yes” button in the email. If you still haven’t gotten the recipe and checked your spam please email me at flippindelicious (at) gmail (dot) com. I’ll see your questions much sooner via email. Cheers! panicking a little! did the flaxseed egg version and my dough isn’t dough..its very crumbly! Can I do anything to fix it? Kids waiting to bake and decorate for Santa’s cookies!! panicking a little. did recipe with flaxseed egg and my dough is not dough – very crumbly..any suggestions? kids waiting to decorate xmas cookies for santa! I just made this cookies a few weeks ago and I LOVE them!! Thank you for sharing! I shared the cookies that I made on my blog and have linked the original recipe back to yours. How did you come up with this recipe? This recipe is actually entirely my own creation. After going gluten free, I was adapting the chocolate chip cookie recipe that I developed when I was a kid (I wasn’t your average kid. I had my own recipe). One of my test batches was a beautiful soft, cakey cookie, that was a dead ringer for the Lofthouse Sugar Cookies I’d been trying to recreate for years. I refined the recipe from there. This recipe is 100% my own, not adapted from anyone else, and is one of my biggest culinary victories. I’m happy that you enjoyed it. Do you think the dough would work well as the base of a dessert pizza? Hi Patty, I don’t see why not. Let me know if you try it. Can these cookies be made egg free as well? Yes they can! I’ve made them several times using an egg substitute with great results. My go-to is a flax egg. I have been gluten and dairy free for over 5 years now. And these cookies and one of the things that I miss the most. I am definitely going to try this recipe. Thanks for figuring it out for us. I’m so happy to be able to help. Happy Baking! Both the weight and volume measurements are correct. When I tested this recipe, I weighed out 18 ounces of my gluten free flour blend and then I scooped it into a measuring cup using a spoon and then leveled off the cup with a knife. The “a pints a pound the world around” only applies to water. Different ingredients weights vary vastly. Also, if you do measure by weight it is crucial to use my gluten free flour blend because a heaver flour would mean less flour and a lighter flour would mean more flour and the recipe won’t turn out correctly. The best approach is to pick either the weight measurement or the volume measurement and follow it all the way down. When you switch back and forth ratios tend to get out of whack. I normally bake by volume now, only because many of my readers don’t have an accurate kitchen scale on hand. Hope this helps! I hope your sister loves the cookies, it is super sweet of you to make them for her. Do you have a recipe for the regular sugar cookies that aren’t gluten free? May I ask what gluten free flour you used? I have lots of notes in the post above about which flours I’ve used successfully. 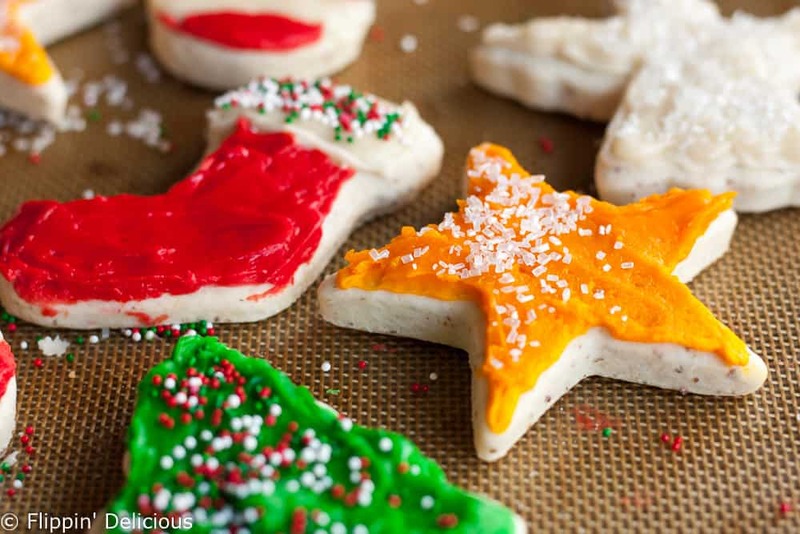 Because sugar cookies are a pretty plain cookie, the flour you use can make a big difference. 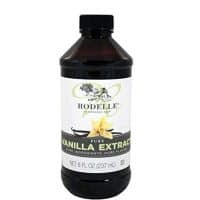 Using a little extra vanilla can also help to disguise any after tastes. If your cookies were grainy, my best guess is that the gluten free flour you used is the culprit. If you used too much flour, it can also make them grainy. The dough should look like it does in my gluten free Halloween sugar cookie video. . It is important to spoon the flour into your measuring cup, and then level it off. If you scoop with the measuring cup directly, you’ll get too much flour and may have grainy cookies. I hope this helps! Please comment back and let me know what gluten free flour you used.